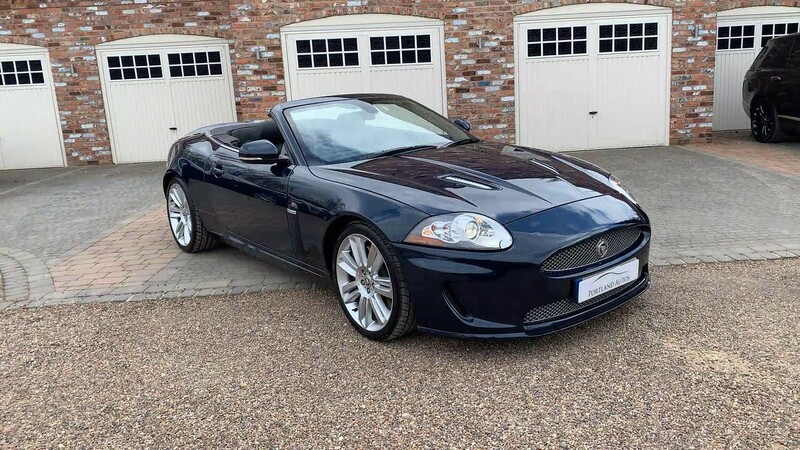 2009/59 JAGUAR XKR CONVERTIBLE IN INDIGO WATERBONE METALLIC WITH WARM CHARCOAL LEATHER INTERIOR AND CONTRAST STITCHING. THIS CAR HAS JUST COME BACK IN PART EXCHANGE, WITH US HAVING PREVIOUSLY SUPPLIED IT IN 2016. SPECIFICATION INCLUDES ADAPTIVE CRUISE CONTROL, HEATED STEERING WHEEL, HEATED SEATS, AIR COOLED SEATS, 20 INCH ALLOY WHEELS, BOWERS AND WILKINS SURROUND SOUND SYSTEM, KEYLESS ENTRY, KEYLESS START, ELECTRIC MEMORY SEATS, ELECTRIC FOLDING MIRRORS, ELECTRIC STEERING COLUMN FRONT AND REAR PARKING SENSORS, AUTO LIGHTS, BLUETOOTH, SATELLITE NAVIGATION, HEATED WINDSCREEN, USB/IPOD CONNECTION, AUTO DIMMING REAR VIEW MIRROR AND CORNERING LAMPS. THIS CAR COMES WITH A FULL SERVICE HISTORY HAVING HAD A TOTAL OF SIX SERVICES WITH THE MOST RECENT ONE CARRIED OUT AT 62,907 MILES. 2 KEYS, HPI CLEAR, PART EXCHANGE WELCOME, FINANCE AVAILABLE. TO VIEW UP TO 40 PHOTOS AND A HD VIDEO OF THIS VEHICLE PLEASE VISIT OUR WEBSITE.